Cell, 2018, 175(1):85-100. Ibrutinib (PCI-32765) purchased from Selleck. BTK C481S and C481T variants show resistance to ibrutinib. (a and b) COS-7 cells were transfected with wild-type BTK or the two variants. Thirty-six hours post transfection, the cells were serum starved and treated with ibrutinib overnight followed by activation with serum and pervanadate for 5 min at room temperature. The cell lysates were immunoblotted for pY223 BTK and pY753 PLCγ2. Leukemia, 2017, 31(1):177-185. Ibrutinib (PCI-32765) purchased from Selleck. Cell lines were exposed to 0, 50 and 150 mM Ibrutinib for 4 h. The level of phosphorylated ERK1/2 (p-ERK1/2) was reduced in TCF3-rearranged MHH-CALL3 compared with non-TCF3-rearranged Nalm6 and MHH-CALL4 cell lines. b-Actin served as a loading control. P-ERK/b-actin: ratio of the intensities. See Supplementary Materials and methods document for more information. Blood Cancer J 2014 4, e181. Ibrutinib (PCI-32765) purchased from Selleck. Phosphorylation of ERK1/2 and AKT, but not BTK, was inhibited in sensitive but not resistant MCL cells. Western blotting of BTK phosphorylation. 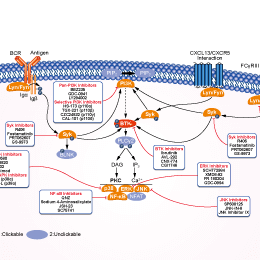 Mantle cell lymphoma (MCL) cells were treated with indicated doses of ibrutinib, cell lysates were collected at 1 or 4 h, and subjected to Western blotting analysis using phosphorylated BTK (p-BTK) (Y223) and total BTK (t-BTK) antibodies. Br J Haematol 2014 166(6), 849-61. Ibrutinib (PCI-32765) purchased from Selleck. Identification of Btk as a potent kinase for WIP tyrosine phosphorylation. Total protein lysates were prepared from THP-1 cells that were stably transfected with wild-type WIP-EGFP and treated with PCI-32765 at the concentration specified on the blots for 2h before pervanadate treatment for 30 min. In all cases WIP-EGFP was immunoprecipitated from cell lysates using anti-EGFP antibody and membranes subsequently blotted with the pY (4G10) antibody, EGFP antibody and β-Tubulin. J Cell Sci 2015 128(2), 251-65. Ibrutinib (PCI-32765) purchased from Selleck. Effect of Ibrutinib on CLEC-2-mediated platelet activation and signaling in humans. Washed human platelets were incubated with Ibrutinib (5 nM) for 5 min followed by stimulation with convulxin (100 ng/ml) or rhodocytin (30 nM) under stirred conditions. Platelet proteins were separated by SDS-PAGE, Western-blotted, and probed for phospho Syk (Tyr525/526) and PLCγ2 (Tyr759). β-actin was used as a lane loading control. J Biol Chem 2015 290(18), 11557-68. Ibrutinib (PCI-32765) purchased from Selleck. BTK is expressed by malignant plasma cells and ibrutinib induces cytotoxicity in MM patient cells. (A) BTK mRNA and protein expression in control B-cells and MM patient cells and MM cell lines as measured by real-time PCR and Western blotting. (B) MM cells (n = 11) were treated with two doses of ibrutinib (1 and 10 μM), bortezomib (10 and 20 nM) and lenalidomide (1 and 10 μM) for 48 h and then assessed for cell death/proliferation by Cell Titer GLO assay. (C and D) MM cell lines were analysed for cell death in response to ibrutinib (1 and 10 μM), bortezomib (10 and 20 nM) and lenalidomide. Cell Signal 2013 25, 106-12. Ibrutinib (PCI-32765) purchased from Selleck. Ibrutinib induces increased cytotoxicity in combination with lenalidomide and bortezomib in MM patient cells. (A) MM patient cells were treated wit h various combinations of ibrutinib (1 and 10 μM), bortezomib (10 and 20 nM) and lenalidomide (1 and 10 μM) for 48 h and then assessed for cell death/proliferation by Cell Titer GLO assay. (B) MM cell lines were analysed for cell death in response to various combinations of ibrutinib (1 and 10μM), bortezomib (10 and 20 nM) and lenalidomide. (C) RPMI8226 cells were analysed for cell death in response to ibrutinib (1 and 10μM), bortezomib (20 nM) and lenalidomide (10μM) and combinations thereof, and then analysed for apoptosis using annexin-V/propidium iodide staining and flow cytometry. (D) Primary human monocytes were treated with two doses of ibrutinib (1 and 10 μM) and then in combination with bortezomib (20 nM) and lenalidomide (10 μM) for 48 h and then assessed for cell death/proliferation by Cell Titer GLO assay. Ibrutinib downregulates anti-apoptotic proteins and induces caspase mediated apoptosis in MM cells. (A) FLIPL , survivin and Bcl- xL mRNA expression was determined in MM patient cells and MM cell lines treated with ibrutinib (10 μM) and bortezomib (20 nM) both alone and in combination. (B) FLIPL protein expression was measured by Western blotting in extracts from RPMI8226 cells treated with ibrutinib (10μM) and bortezomib (20 nM) both alone and in combination for 8 hours. (C) The MM cell line RPMI8226 was treated with the pan caspase inhibitor zVAD-fmk (10 μM) before treatment with ibrutinib (10 μM) and borte zomib (20 nM) both alone and in combination for 48 h and then assessed for cell death/prolife ration by Cell Titer GLO assay. 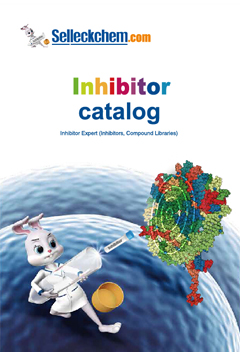 In vitro kinase IC50 values are measured using 33P filtration binding assay after 1 hour incubation of kinase, 33P-ATP, Ibrutinib, and substrate [0.2 mg/mL poly(EY)(4:1]. Assays are performed at Reaction Biology. MTT (3'[4,5-dimethylthiazol-2-yl]-2,5-diphenyl-tetrazolium bromide) assays are performed to determine cytotoxicity. Briefly, cells (CLL B cells or healthy volunteer T cells or NK cells) are incubated for 48 hours with different concentrations of Ibrutinib, or vehicle control. MTT reagent is then added, and plates are incubated for an additional 20 hours before washing with protamine sulfate in phosphate-buffered saline. Dimethyl sulfoxide is added, and absorbance is measured by spectrophotometry at 540 nm in a Labsystems plate reader. Cell viability is also measured at various time points with the use of annexin/PI flow cytometry. Data are analyzed with Expo-ADC32 software package. Results are expressed as the percentage of total positive cells over untreated control. Experiments examining caspase-dependent apoptosis includes the addition of 100μM Z-VAD. Animal Models: MRL-Fas(lpr) lupus model and collagen-induced arthritis model. Formulation: Ibrutinib is dissolved in DMSO. Honigberg LA, et al. Proc Natl Acad Sci U S A. 2010, 107(29), 13075-13080. Herman SE, et al. Blood. 2011, 117(23), 6287-6296. Chang BY, et al. Arthritis Res Ther. 2011, 13(4), R115. Ponader S, et al. Blood. 2012, 119(5), 1182-1189. How to reconstitute the compound S2680 for in vivo studies? For in vivo study, we suggest to use 5% DMSO+30% PEG 300+5% Tween 80+ddH2O up to 10mg/ml.